Having a notion of when something causes something else is paramount. We have evolved some subtle notions since Shamanism (or David Hume). a) The paucity of the imagination of many pillars of intellect. In 2008, there was a huge spike in the price of crude oil, followed by an equally impressive crash. What caused it? Nobody in the economic establishment had a public answer. However, I had an obvious one: crude oil futures, a type of financial derivatives which can be manipulated, thanks to the gigantic leverage in the futures’ market. In general, correct reasoning and causality means looking at the wholeness of the spatially implicated order. Do we have a physical model for this? Yes, Quantum Physics. b) Many thinkers claimed, especially generations ago, that Quantum Physics destroyed causality. The exact opposite is true: the Quantum has expanded the notion of causality (to the implicate order). 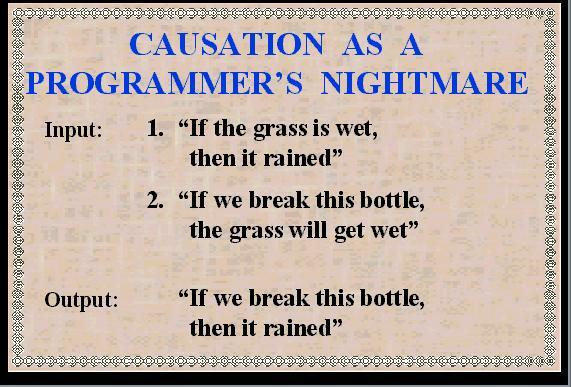 SO WHAT’S CAUSALITY? A CAUSES B WHEN A LOGOS GOES FROM A TO B. Old fashion causality involves forces. A force points from a point to another point (it’s called a “vector”; forces actually gave the mathematical concept of vector). However, there are no points in Quantum Physics. But before I get to the Quantum, let me explain my philosophical concept of causality. What’s causality? An event A is said to cause an event B if whenever A occurs, so does B, and a logos, a discourse, goes from A to B. (That logos is, in precise science, an evolution equation and its attached notions). Does that mean all causality arise directly from statistics, and only from statistics? Not really: a differential equation E predicts (if well behaved!) the evolution of a system S. Then knowing S(t) one can get S(t+1). In this case one says that the initial conditions S(t), plus the law E, cause S(t+1). Some make a big deal that equation of physics are reversible, they see that as indication of time travel, or something weird. However, whether the equation E is time reversible, or not, is irrelevant: one plugs in (t+1), not (t-1). The Quantum, some who know it all too little, was said to have destroyed causality. In truth, Quantum Physics is all about Non-Commutative Geometry (and not just in Alain Connes’ restricted sense; this is the main argument for Super Symmetry). In clear language; no more points. Then old fashion, point to point causality does not apply. In Quantum Physics, is waves writ large. Quantum guidance is all about waves. According to De Broglie’s Wave Principle, all and any particle is guided by a wave. Yes, that would be true even for trucks. It was recently confirmed at a larger scale than atoms and molecules. Hitting a wave with another wave is messy. Causal, but messy. Thus causality in Quantum Physics tends to be probabilistic. The wave guiding proceeds at a speed much higher than the speed of light (at least 10^10 c). Call it TAU. Thus any Quantum Process embraces the totality of accessible space. Moreover that space is a Hilbert space (not just 3 dimensional space). This means that the causality (the set of causes) in any Quantum process involves not just a Cauchy data set, the classical way, and an evolution equation (Schrodinger, Dirac, Klein-Gordon, etc., but an entire space “visualized” by the Pilot Wave at speed TAU (> 10^10). Notice that many of the preceding is not part of the conceptology of those who claim that Quantum Physics is not causal. Most of them probably do not know what a Hilbert space is (that the Pilot Wave proceeds in a Hilbert was an early objection against it; it’s as intelligent as protesting that the sky is blue). Once all the ingredients are in, including CAUSAL SPACE, Quantum Physics is completely causal. Conceptually speaking. Those who are elaborating, as we speak, Quantum Computers are trying to make Quantum Physics so incredibly causal, that it will be able to easily make CAUSAL relationships that traditional classical computers cannot do (and cannot check!). One has to understand that classical computers work, indeed, according to classical mechanics. They are glorified water clocks (with electrons flowing). The Quantum Computer will convince the Commons that Quantum Physics is more causal than pathetically precise classical physics. Ultra pathetic precision leads classical physics to arbitrarily large errors. Whereas computing with waves is forgiving, hence more precise in the long run. Time to get causal in the wavy way, people, embracing wholeness and the implicate (spatial) order famed physicist David Bohm was speaking (more or less) about. The real truth is going to be even more subtle (to simplify this essay, I neglected Quantum Entanglement). Conclusion? Whenever there is a logic, there is a context, and the logic implicates the context. This is true in pure logic (from introspection, and writing logic down), but also in the Quantum world (from experimenting in the real world). Logic without context is nothing. Physics without space is nothing. Nature without the implicate spatial order is nothing either. Thinking globally is the only thinking there is.